It was good to have you with us yesterday at Rudolph G. Gordon Elementary for the SC Chapter Fall Tour. Special thanks go to superintendent Dr. Burke Royster, staff of Greenville Co. schools, principal Ms. Jackie Parker and our twin school ambassadors Ashley and Kaleigh who helped us with the tour and their perspective of "school life". Thanks also to Kahn Construction, Contract Construction and McMillan Pazdan Smith for being our sponsors for the day. The networking with each other was engaging and central to our mission of school design, use of space and build. The site tour and manufacturing theme of the school that will be integrated with the NEW Fountain Inn High School adds to preparing all students to be college and career ready. We hope we can call on you to be key participators at our spring conference in Charleston on March 17-20, 2019. Look for coming news on the A4LE website. Best to you and your family this Thanksgiving. Learning session and school tour of Rudolph G. Gordon Elementary School, followed by lunch. Presenters: Mr. Michael Chewning, Ms. Paulette Myers, McMillan/Pazdan/Smith Architecture and Mr. Terry Mills, Director of Construction for Greenville Co. Examine the effectiveness of dividing learning spaces into pods that have equal easy access to labs. Observe how the use of outdoor learning spaces is successfully impacting student learning outcomes. Learn about the challenges of incorporating large manufacturing equipment into a school setting where safety concerns are emphasized. 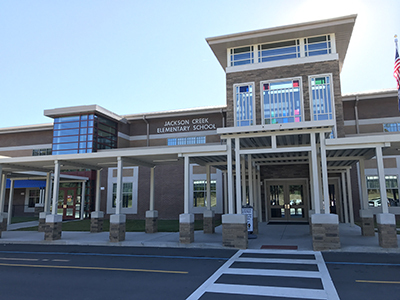 Please join us for a tour of Jackson Creek Elementary School, an innovative K-5 school grounded in a Growth Mindset, meaning that all children have strengths and can learn to build on these strengths. This school, inspired by Frank Lloyd Wright’s style and stained glass windows, highlights the colored flags of the International Boulevard area where the school is sited. Designed for flexibility, 21st century learning and collaboration, this elementary school’s unique design features grade levels grouped in “neighborhoods” where a central “learning hub” area is shared by a group of 5 to 6 classrooms. 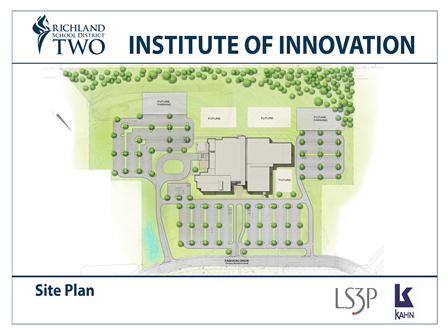 Richland School District Two in northeast Richland County, South Carolina is home to the brand new Richland Two Institute of Innovation, or more commonly called R2i2. Richland Two has always been a leader in innovation and ahead of the curve in South Carolina when it comes to learning opportunities for students. Designed by LS3P, and built by MB Kahn Construction Co. Inc. R2i2 is not your traditional school or career center. R2i2 is much more – inspiring innovation and critical thinking. Providing students access to course work that is not offered anywhere else in the district, the two-story student learning center is one of five unique components that comprise R2i2. 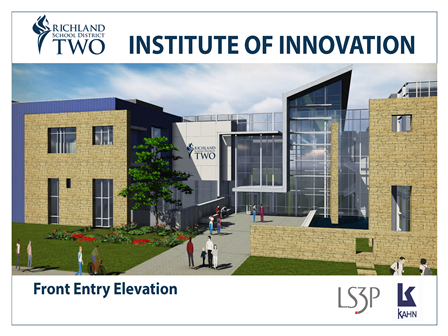 Designed around current economic needs in the Midlands such as NextEnergy and Supply Chain Logistics, R2i2 utilizes innovative teaching and learning practices – indeed, R2i2 transforms education. The R2i2 Central Community Space is truly making a difference. The Richland Two Convention and Conference Center is housed at R2i2, affording the only conference center in northeast Columbia. The center can host conferences, meetings, shows, or even weddings. Additionally, partnering with the Richland Library, the district built a 35,000 sq. ft. library and auditorium as part of R2i2. The district administrative offices have also found a new home at R2i2. Consolidating staff in the three story 40,000 sq. ft. building, the offices offer a district board room, small meeting spaces, spaces for community services, as well as a commercial kitchen and dining area. Learn about design concepts that best support different approaches to learning and new curricula. Observe the design solutions that are conducive to cooperative learning. Learn about the planning process that was the foundation of the project. Understand how the new ways and objectives in education require new concepts in school design. Take I-20 east toward Florence. Take Exit 80, Clemson Road. Turn left off the exit. Go 4.0 miles and turn left onto Marketplace Commons at the Village at Sandills. (second entrance). Go 0.5 miles and R2i2 is on your right. You may park anywhere in front of building. Take I-26 towards Columbia. When entering Columbia, Take I-20 east toward Florence. Take Exit 80, Clemson Road. Turn left off the exit. Go 4.0 miles and turn left onto Marketplace Commons at the Village at Sandills. (second entrance). Go 0.5 miles and R2i2 is on your right. You may park anywhere in front of building. Take I-26 towards Columbia. Take I-77 North to Charlotte. Take I-20 east toward Florence. Take Exit 80, Clemson Road. Turn left off the exit. Go 4.0 miles and turn left onto Marketplace Commons at the Village at Sandills. (second entrance). Go 0.5 miles and R2i2 is on your right. You may park anywhere in front of building. Take I-20 west towards Columbia. Take exit 80, Clemson Road. Turn right off of exit. Go 3.7 miles turn left onto Marketplace Commons at the Village at Sandills. (second entrance). Go 0.5 miles and R2i2 is on your right. You may park anywhere in front of building. Please join the South Carolina Chapter and the Beaufort County School District for a tour of River Ridge Academy on October 16, 2015. 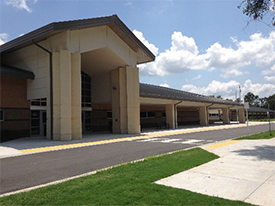 River Ridge Academy is a PK-8 school serving both neighborhood students and students attending for Choice Programs such as Montessori and Project Based Learning-STEM programs. This 143,752 square foot building designed by Hite Associates Architects and built by Thompson Turner Construction was completed in an unprecedented 12 month construction schedule. It opened on time and on budget. Its 54 acres includes an athletic complex for baseball/softball, football and a play/practice field. "What you will see inside," says Principal Gary McCulloch, "is a school that has been constructed, furnished, designed and programmed for what I am most passionate about – and that's kids." You will also have the opportunity to tour the new May River High School, currently under construction only a few miles away. 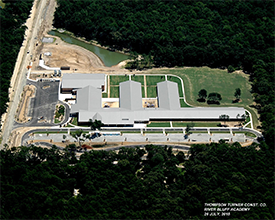 Also designed by Hite Associates Architects and being built by Thompson Turner Construction, May River High will open in August 2016. Transportation from River Ridge Academy to May River High School will be provided. Exit 8 (Hwy 278) towards Hilton Head. Exit Hwy 170 – take a right at the bottom of the ramp. Turn left at 2nd traffic light onto Bluffton Parkway. Take a left onto River Ridge Drive and the school will be on the right. Tour an exciting new elementary school! The South Carolina Chapter plans to schedule tours in the fall and late spring to allow our members to witness the types of facilities that other districts are constructing. This is wonderful opportunity for dialogue and learning between administrators, facility representatives, contractors, construction managers, designers and vendors. 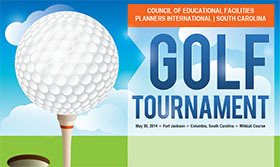 AIA CEU's will be available!